Shop the trends – this season it’s all about spots and stripes! Both fashion trends are chic, fun and flattering, and best of all, easy to wear! We show you how to style them for any occasion. It couldn’t be easier; Breton-style navy and white tops are always crisp and clean and give you that fresh Spring look! So take one classic stripe top with a twist (frill cuff sleeves) for a fashionable approach to stripes this season. Our stylish Frill Cuff T-shirt looks super chic worn with blue denim or our White Jeans. It’s a versatile and easy look you can wear everyday! Dress it up (accessorising with a handbag and jewellery) or down (trainers and a denim jacket), whatever the occasion. You can mix and match stripes! Not only do Stripe Wide-leg Trousers make a bold style statement, they are ultra-flattering too, with the vertical stripes elongating your legs! A versatile addition to your wardrobe, this red and white striped navy pair can be dressed up or down, great for casual get togethers or smart occasions. Simply pair with trainers and a t-shirt, then pop a leather jacket or blazer over for a weekend shopping trip with the girls. Elegant evening soiree? Swap the trainers for heels and add a statement necklace for a bit of sparkle! 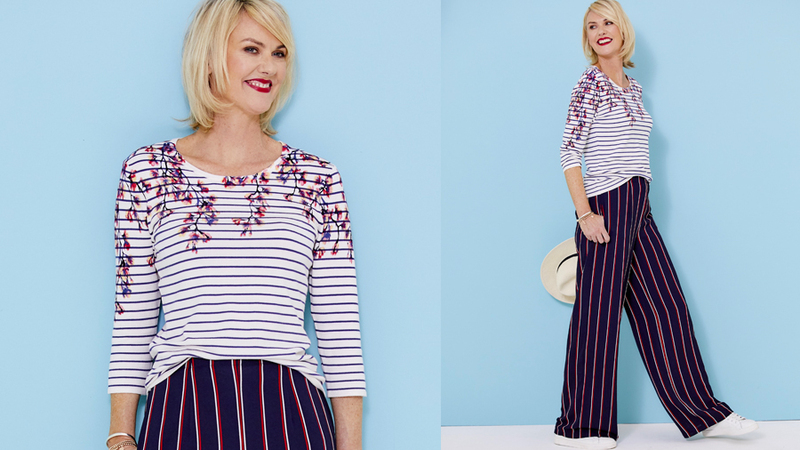 We’ve teamed our gorgeous wide leg trousers with our Striped Floral Jumper for the ultimate nautical Summer look. It just shows you don’t need to steer clear of double stripes! With feminine floral detail over the stripe pattern, it’s the wardrobe essential that you can wear day through to evening. For a more relaxed look you can just wear it with your favourite jeans and layer over a lightweight padded jacket. One of our favourites – this Frill Sleeve Blouse is the easy way to introduce spots to your wardrobe. A go-to special occasion piece – think christenings or birthdays – you’ll love the flattering collar and frill sleeves, it’s fun, feminine and can be worn with either skirts or trousers. If you’re jetting away, be sure to pack a pair of white trousers and wedges to wear with your spots for an effortlessly chic holiday look. For a bright Summer look why not be bold and complete the look with our Red Chinos? These on-trend narrow leg chinos will add a pop of colour to your outfit and complement the spots! They look great rolled up with flats or down with your favourite pair of heels. And because chinos have a classic look, they’re super chic worn with a tailored blazer for a smart outing, or a knitted cardi for a more relaxed affair.